Some years ago I really got into "Light Graffiti" and spent a lot of time experimenting with various different torches and homemade light systems to get a variety of different results. 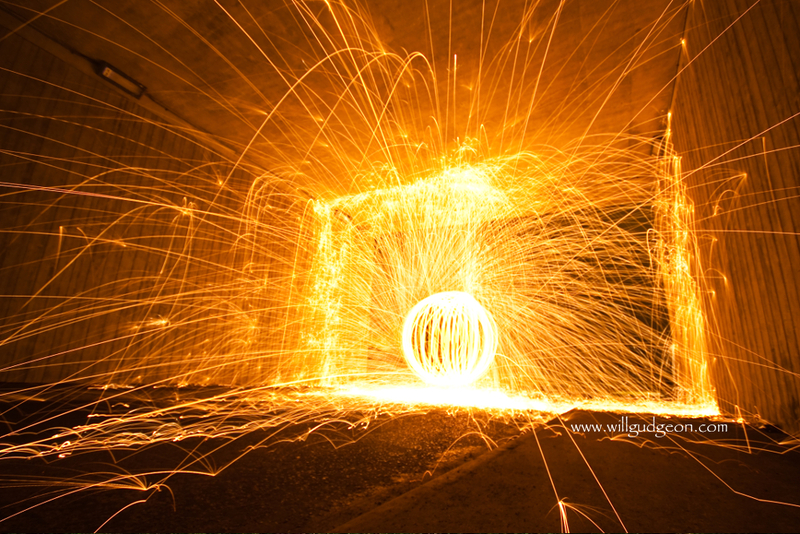 I then discovered Fire Balls which became a little obsession of mine for a while, not only do they look cool, they are also great fun and very simple to do. 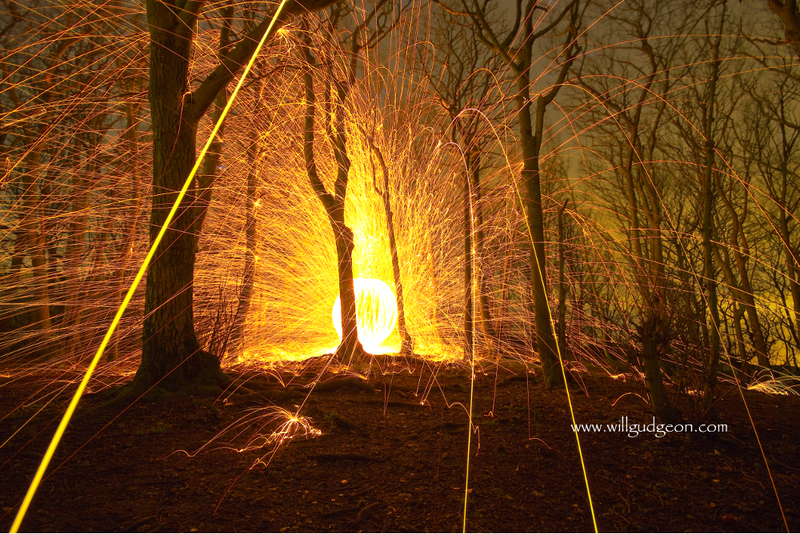 The process is simply spinning some Fine wire wool around on fire in a cage on a lead with a long exposure. 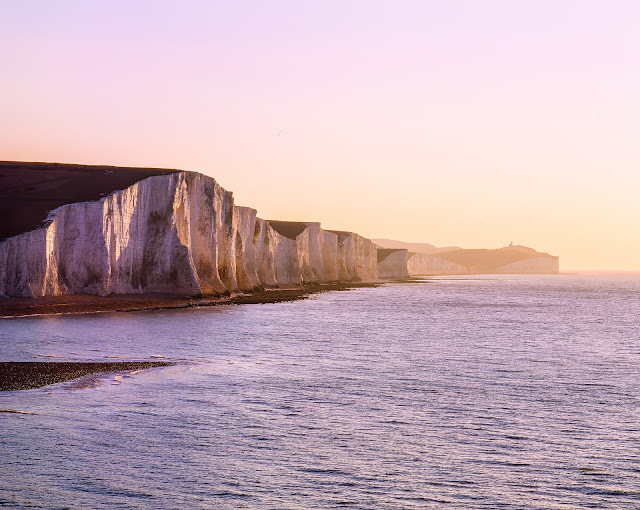 Find a dramatic location that will work well. this needs to be at night/shortly after sunset works well, the sparks will not show up during the day. 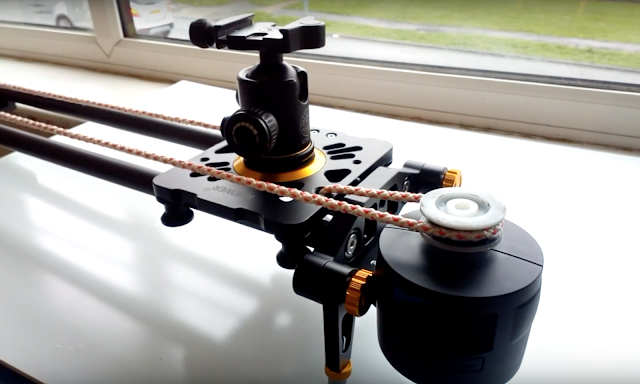 Set your camera onto a tripod, ideally with a wide angle lens attached (also worth placing a UV filter over lens to protect it from sparks). Make sure you are shooting in RAW to make fine adjustments in post-processing after. Choose a composition, work out your exposure time, focus on the spot where you will be standing, fire a few test shots first, and make sure your happy with everything and everything is safe. You will get results from just a few seconds but ideally 10 seconds and upwards will be best. 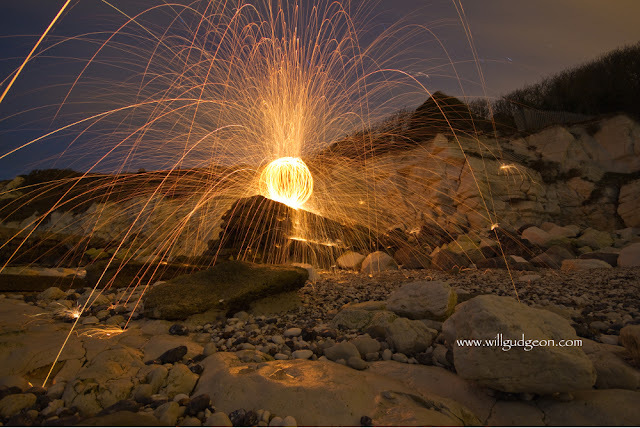 Wire wool will burn for around 10 seconds, doing a longer exposure will help get more detail out of the shadows if you want that, you can also add a flash to bring out other details. Place a load of steel wire wool into your whisk/cage, attach it to a lead. Ensure you have as much skin covered as possible and your safety goggles on. If you have help (highly recommended) single to them when to fire the shutter, or set self timer and get into location. Light your wire wool and start spinning, the faster you spin the wool the further it will go, rotating yourself on the spot will create a ball/orb, keep spinning until all sparks have stopped. Make sure all fire is out and nothing else is on fire before checking your results, make any adjustments that may be necessary if needed. Try a few different things, like walking along with it to create tunnels, spinning it above your head etc. If something does go wrong, like burning yourself or burning something down, getting arrested, or generally anything illegal or stupid etc. I am not responsible for any of your actions. So don't blame me. Enjoy it and do it safely. 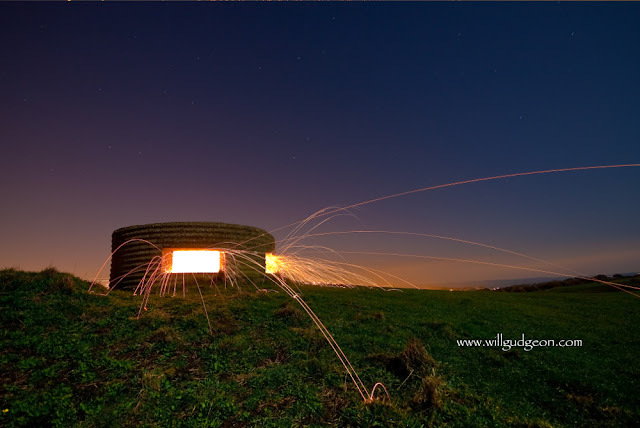 This was a tiny war bunker not big enough to stand up in, so spinning a fire ball around was a nightmare, kept hitting the ceiling and sides, this is a combination of 2 photos as I had to do this twice to get enough sparks out of the windows, 90% of the sparks stayed in with me. Standing ont the ledge slowly spinning around to create to orb. Beaches are great location for this sort of thing. I did this after a load or rain, to minimise the chance of burning the woods down. Tunnels are again a great location for this sort of thing, make sure its either on a unused road or you have a spotter further up each end of the road to keep an eye out for cars.